Color to Go: The SpectroPocket Box and Android. Digital Information to Unveil SpectroPocket™ for Android™ – the World’s First Solution for Measuring Color with Smartphones and Tablet Computers. Swiss manufacturer Digital Information is pleased to announce that they will be unveiling their all new SpectroPocket for Android, the world’s first system for measuring single color patches on different substrates using commercially available spectrocolorimetry and displaying the recorded color values on any mobile Android device, at IPEX 2014 in London. Prior to the release of the all new SpectroPocket, PC hardware and operating systems such as MS Windows or Mac OS restricted flexibility and mobility when measuring color. The introduction of Digital Information’s SpectroPocket for Android represents a great stride in the portability and functionality of color measurement technology. For the first time, it is possible for smartphones or tablet computers to connect directly to scanning spectrophotometers via an external USB interface. Users can now measure color virtually anywhere with lightweight equipment — on-site at a customer facility, in the office, at the laboratory, on press — or, wherever your business takes you. 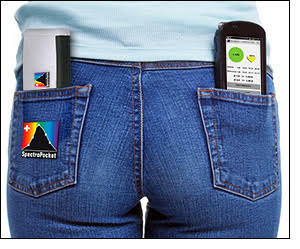 SpectroPocket runs on smartphones and tablet computers with Android operating system. SpectroPocket for Android is a compact, portable, box-shaped device with integrated software and rechargeable USB battery which connects directly to the spectral measuring device via USB. 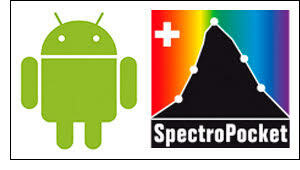 Communication between the SpectroPocket and the mobile Android device is transferred via Bluetooth technology. Spectral values are then interpreted and displayed on the Android smartphone or tablet computer using an Android App. All display modes necessary can be viewed on the Android device: spectral remission values as figures and curves, as well as LAB, density, XYZ and RGB values. Color differences between two measurements are shown as Delta E. Perfect color densities derived from spectral measurements are calculated by the BestMatch function. For further use on the web or in the Cloud, the entire series of measurements can be easily exported or imported as standard CxF™ (Color Exchange Format) format files, or transmitted to another Android device. Currently, SpectroPocket for Android supports the i1 Pro™, i1Pro 2, and ColorMunki™ Design scanning spectrophotometers from X-Rite. The cost-effectiveness of purchasing the complete SpectroPocket for Android solution bundle including the SpectroPocket hardware and software, supported spectrophotometer, Android-enabled device, and SpectroPocket App represents a significant savings over the purchase of far more costly portable measuring instruments currently available on the market. Looking ahead, Digital Information will be launching SpectroPocket Report, an Internet-based database. Evolving from Digital Information’s world-class InkZone Report, SpectroPocket Report is a color database developed to enable customers to view and manage the color data from their SpectroPocket on the web. Please visit the Digital Information booth at IPEX trade show, ExCel Exhibition Centre London, United Kingdom, from March 24 to 29, 2014.